Our doors at Leake's Chapel are always open! We offer a traditional worship service with a new contemporary twist. We encourage all people of all backgrounds to worship the Lord with us! We are at 2334 Honeyville Road, Stanley, VA 22851. Please use the directions provided on this website as many online maps sources are incorrect in our location. Take 340 South into Stanley. Once in town, take a Left on Honeyville Ave. At the end of this road, take a Right and then an immediate Left onto Honeyville Road. Stay on Honeyville Road for approximately 2 miles. The church will be located on a sharp curve. It takes approximately 20 to 25 minutes from Luray. Take 340 North towards Stanley. Turn right onto Business 340 towards Stanley. Continue on this road for approximately 1.5 miles. Take an immediate Right after the Alma Bridge onto River Road. Stay on this road for 0.7 miles and turn Left on Honeyville Road. 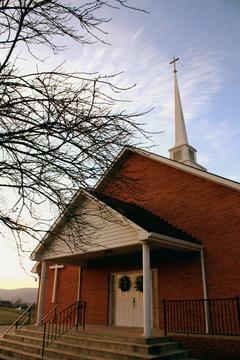 The church is located on the Left approximately 1 mile up the road. It takes approximately 20 minutes from Shenandoah. From I-81 take exit 264 for New Market. Turn East on Route 211. Follow the signs to stay East on Route 211. You will cross a mountain. At the foot of the mountain, turn Right on 340 South. After about 3 miles, turn on Business 340 towards Stanley. Continue on this road for approximately 1.5 miles. Take an immediate Right after the Alma Bridge onto River Road. Stay on this road for 0.7 miles and turn Left on Honeyville Road. The church is located on the Left approximately 1 mile up the road. It takes approximately 25 minutes from New Market. From I-81 Exit 247 towards Elkton via Route 33. Stay on Route 33, until the Elkton exit. From this exit, veer right onto 340 North. Continue straight on 340 through Shenandoah. Then follow the directions from Shenandoah. It takes approximately 1 hour from Harrisonburg. When you walk through our doors, there will be several friendly faces to greet you! You'll immediately feel the love and hear the laughter of our warm hearts. Simply sit back, relax, and let the spirit move you during our traditional worship service. Yes! There is the large parking lot where most park, but we have a special parking lot on the side of the church for those needing handicap facilities. Simply park next to the chapel (on the far side of the church) to use the ramps and avoid the stairs! If assistance is needed, don't hesitate to ask. We're always here to lend a helping hand! While most people at Leake's Chapel have a tendency to dress in "Sunday best" we do NOT discourage anyone dressed casually. We would much rather have you join us in worshiping our Lord and Savior than turn away for unimportant reasons! There is a nursery located behind the sanctuary opposite of the restrooms. The nursery has plenty of toys to keep the young ones entertained, as well as a window and speaker so that adults won't miss the worship service. Is there a junior church? Yes, there is a junior church for elementary and middle school age children. The teachers are listed in the bulletin each week. It is located in the downstairs kitchen of the Chapel. Go straight down the hall way, and down the stairs. The kitchen is straight and to the left.